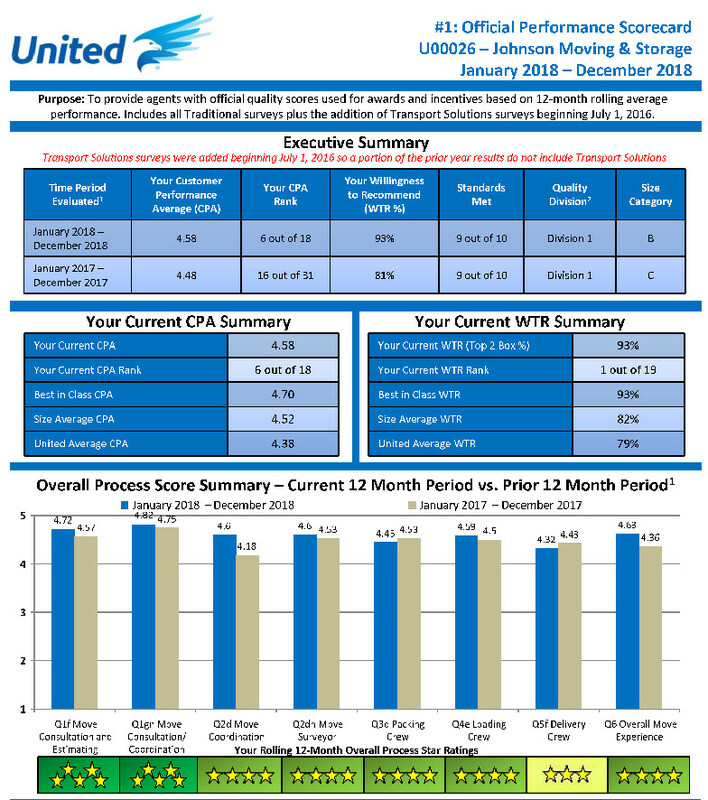 Johnson Storage & Moving announced today that it recently attained the highest Willingness to Recommend ("WTR") score in its class at its flagship Centennial, CO headquarters location. As an agent for United Van Lines, Johnson's surveys all of its Interstate moving customers to solicit feedback on every aspect of their relocation experience. The Catch-All question at the end of the survey asks, "Based upon your overall moving experience, would you recommend Johnson to a relative or close friend." This question is heavily weighted in the survey and reflects the customer's ultimate level of satisfaction with the service delivered on their move. Johnson's Benchmark Willingness to Recommend score rose from 81% to 93% in 2018 as the result of an intensive emphasis on quality, training and frequent job checks on Johnson moves. 93% WTR places Johnson 1st out of 19 movers in its size class among the top scoring United agents in the country for customer satisfaction. "We are proud of our awesome team at Centennial and grateful for their tireless efforts to please our customers" said Johnson's President, Don Hindman. Johnson Storage & Moving is one of the oldest and largest moving companies in the western U.S., dating back to 1900 in Denver, Colorado. Johnson was named the Top Consumer Services Business in Colorado by ColoradoBiz magazine in 2018. Johnson's owns and operates 14 locations across the U.S. and international and employee 550 associates in 11 sates. For additional information, please contact Don Hindman at dhindman@johnson-united.com.